Syncro Soft strives to deliver innovative products that create value for our customers, and as such periodically releases new products or product versions. Therefore, as part of a product’s lifecycle, older product versions eventually reach their natural end of life. It is Syncro Soft’s goal to make this process as transparent as possible to customers and partners, thereby enabling them to plan for upgrades, migrations toward supported product versions. This document set out Syncro Soft's End Of Life (EOL) policy milestones and defines the lifecycle of each product and the types of technical support available during this lifecycle. Unless otherwise expressly set forth in the customer’s agreement with Syncro Soft or on Syncro Soft’s website at https://www.oxygenxml.com the terms of this EOL policy will apply for each product version licensed from Syncro Soft. It is effective as of February 15, 2019 and is an update of the version dated March 1st, 2012. Syncro Soft reserves the right to modify this policy for specific products as business demands justification. Any specific questions can be directed to . The following image shows how end of life milestones for three consecutive versions are interconnected on a time scale. At any time, besides the general available version, there are two other previous versions that are maintained under a different level of support that correspond to its milestone. A major version is released as General Availability (GA) for all customers. The GA milestone signifies when a new major version can be purchased. The Syncro Soft technical staff supports the GA product version by delivering free minor versions and maintenance builds that address customer needs. To address a problem encountered with a version of the software in GA, Syncro Soft may require that the customer must first install the most recent minor version or maintenance release (latest build). This is the date that a specific major product version will no longer be available for purchase. This is generally the date at that the next major version becomes GA.
End of Sales ("EoSale") versions are fully supported in the form of maintenance builds. However, Syncro Soft does not offer new minor or patch versions or support for new/updated versions of operating systems, JVMs, databases, or standards. Generally, to gain new functionality and/or new platform, application, or JVM support, customers should upgrade to the latest GA release. To address a problem encountered with a product version in End of Sale, Syncro Soft may require that the customer must first install the most recent minor version and maintenance build for that version. Beyond the End of Sale date, Syncro Soft will no longer renew the SMP agreements for the product version that is End of Sale. However, Syncro Soft will continue to provide support for customers holding a valid SMP. The End of Maintenance ("EOM") milestone marks the start of the product version retirement period. From this milestone, the product version is no longer maintained by maintenance builds. Syncro Soft will continue to offer help desk support for a period of 12 months (unless otherwise stated) until End of Support date. During this period, Syncro Soft will answer questions and assist customers with the transition to the new product version. To address problems encountered with a product version in End of Maintenance, the customer must upgrade to the GA version, if an existing maintenance build or workaround is not available. 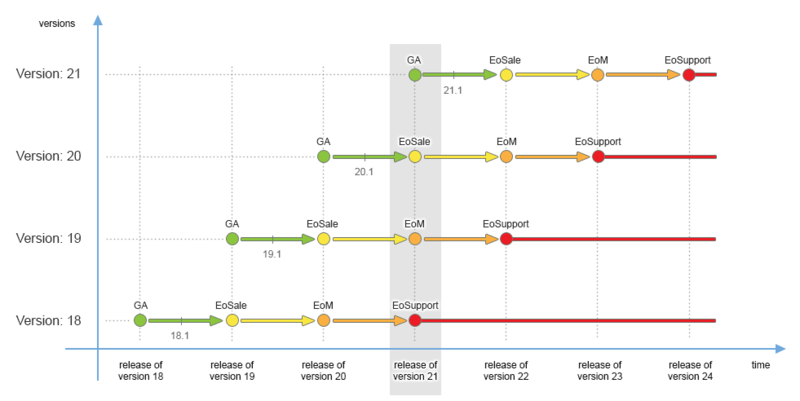 A product version reaches its EOM at the point at which it is 2 major releases behind the current GA release (e.g Version N reaches EOM when Version N+2 becomes Generally Available). The End of Support ("EoSupport") milestone marks the date after the technical support for that product version will no longer be available. Customers may continue to use the product version once End of Support is announced. However, customer problems reported will not be fixed or worked on by Technical Support. Customers are encouraged to upgrade to the GA version as soon as possible. Major release number (the “X”). Minor release digit (the “Y”, where Y ≥ 1). Patch release digit (the "Z", where Z ≥ 1). The pacth digit is optional and it may be referred to as an update release. Releases with a change in the first digit X are major releases (e.g. 21.0 or 22.0), releases with a change in the secondary digit Y are minor releases (e.g. 21.1, 22.2), and releases with a third digit are pacthes. A Major Release (X.y.z) typically includes significant new features and functionality, and enhancements to existing features. It incorporates all applicable error corrections made in prior Major Releases, Minor Releases, and Maintenance Releases. The first number (X) of the version of the software indicates the major release version number. This number will increment with each major release. Digits 'Y', and optionally 'Z', are all set to zero with a new Major release. A new Major release simultaneously causes the prior Major release to reach End-of-Sale. Note that Support services including potential fixes for the immediately previous release remains available consistent with the policies defined herein. A Minor Release (x.Y.z) typically includes enhancements to existing features, possibly minor new features and functionalities, and incorporates the latest bug fixes (at the time of the minor release general availability). The first digit ('Y') after the dot indicates the minor release version associated with a particular major release. Every time a new minor release is issued, the minor release version digit is incremented. An Patch Release (x.y.Z) is an optional release intended to provide a quick response for significant customer issues and other incremental improvements. They incorporate all applicable error corrections made in prior Major or Minor Releases. 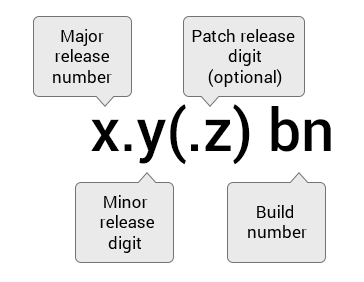 The 'Z' digit will increment when a new Patch release occurs while the 'X' and 'Y' digits remain unchanged. 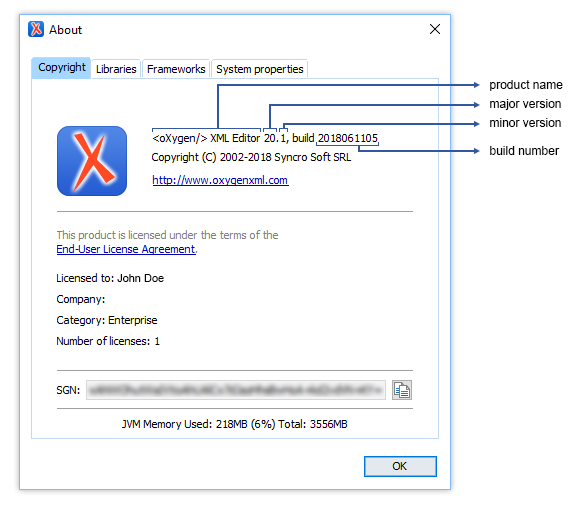 A Maintenance Build is a unique, alphanumeric identifier, that is updated for each new release and it helps to identify the chronological software build history. Every version release (major, minor, or a patch) features a different maintenance build number (that is a different binary kit). Sometimes, a maintenance build may identify an independent release used as a way to deliver fixes for issues that have been identified once a product version has shipped and that are severely affecting a number of customers and therefore cannot wait for the next major, minor, or update release. Syncro Soft recommends all customers to upgrade to the latest Maintenance Build release. End of Support should not be interpreted as the discontinuance of any existing Syncro Soft agreement. Services to the existing product base will continue to be provided as per existing contract terms. A feature release may deprecate certain features from previous releases. If a feature is deprecated in release X.0, it will continue to work in all X.y versions (for all versions of X). Deprecated features may be removed in the X+1.0 release. Syncro Soft’s goal is that the current product version API/SDK is to remain compatible with the previous version to allow third-party applications/plugins developed with a previous version to work with the new version. Applications and add-ons developed for a major product version are expected to be compatible with any minor version belonging to that major version. When Syncro Soft removes existing APIs, Syncro Soft will use commercially reasonable efforts to provide advance notice of a minimum of 12 months of any material discontinuation of API functionality. Syncro Soft will use commercially reasonable efforts to support any deprecated API for the duration of the current major release. Syncro Soft will aim to support major new platforms/databases/operating systems as quickly as possible after the vendor release. However, variability of vendor releases and constraints on internal resources may affect compatibility. Syncro Soft will use commercially reasonable efforts to apply this End of Life Policy to third-party software included in a product version. However, Syncro Soft cannot guarantee that support for any such third-party software will be available. Syncro Soft will provide as much notice as reasonably possible related to support for the third-party software. Why is there an End of Life policy? Syncro Soft established a general End of Life policy in order to better communicate and set proper customer expectations about the availability and support for its products. The End of Life Policy establishes a clear guideline that will assist customers in managing their software requirements. How long can I legally use my product version after the End of Support has taken effect? This End of Life policy does not affect your right or ability to use a product version. It only affects your ability to access technical support for the End of Life product version. When are customers notified about a product version milestones (End of Support)? Generally, product versions are traversing the life cycle without notification, based on the release schedule. Customers may be notified of product end of support. Can I still get technical support for a product version that has reached End of Support? Generally, technical support is available for a maximum of three major versions of the product at a time, with some corresponding limitations. In the absence of a custom agreement between you and Syncro Soft that stipulates otherwise, all technical support stops at the End of Support date. You are advised to upgrade to the last GA version. My agreement with Syncro Soft stipulates different terms that are stated in the general policy. Are my agreement terms valid? Yes, this documents specifies the general policy. If you have special negotiated terms, they will supersede these general guidelines. If you have questions or concerns about your rights, please contact Syncro Soft directly. Syncro Soft develops the industry-acclaimed Oxygen XML Editor, facilitating teams in small businesses, Fortune 500 enterprises, universities, government agencies, and international organizations in authoring documents, publishing in different formats, collaborating with team members, and managing content. At the same time, Oxygen enables XML developers to develop advanced stylesheets, edit schema, generate documentation, debug files, and connect databases. It is the only tool that supports all XML schema languages. It provides the widest coverage of state-of-the-art XML technologies, complies with standards of World Wide Web Consortium (W3C) and of other organizations, and enhances productivity through an intuitive and innovative authoring and development environment. For further information and/or any comment on this End of Life Policy, feel free to contact: .